Update (11/25/09): This method is all wrong. Here is the correct way. A thread on Tek-Tips came up recently about making a progress bar for a file uploader in Perl. Investigating the issue more closely, I found a couple of commercial solutions (read: paid for), where even their free edition involves thousands upon thousands of lines of code, spread out across many different files. Nowhere to be found was a simple, straight-to-the-point example of how this could be done. The CGI script accepts along with your file, an "action" of "upload" - this instructs the CGI file to accept your uploaded file, create a session file and begin saving it to disk. 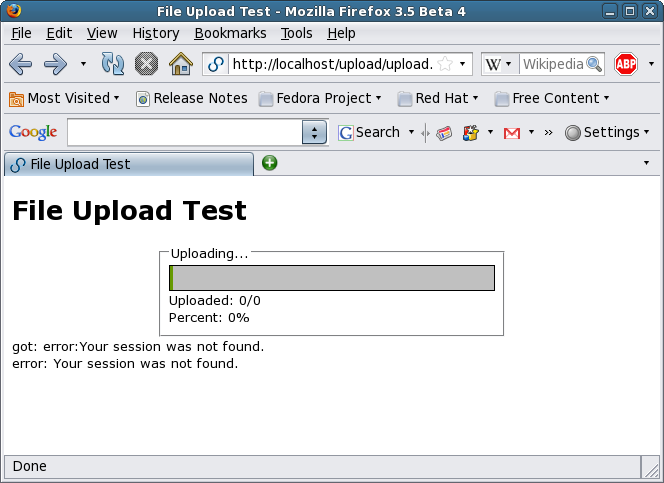 While your browser is waiting for the CGI script to finish processing your form, ajax is running in the background polling the CGI script with a different question: "action" = "progress"
When the CGI is polled for the progress of the uploaded file, it checks how big the file was, and how much has been saved already, and returns some simple numbers. The screenshots, code, and download link follow. // When the form is submitted. // Show the progress indicator. // Wait a bit and make ajax requests. // Poll for our progress. // Get vars outta it. // Was it an error? # They just submitted the form and are sending a file. # This session ID would be randomly generated for real. # Create the session file. # Start receiving the file. # They're checking up on their progress; get their sess ID. # Get their file size and name. # How much was downloaded? # Print some data for the JS. Notes on this code: it's just a proof of concept. You'd want to handle the sessions better. Here the session ID is hard-coded as "my-session" -- that wouldn't work in real life. But it's just a barebones working implementation of a file upload progress bar, with all the crap cut out and does specifically what it's supposed to. Others should find it useful, so you can download it. There are 11 comments on this page. Add yours. I tried it, too. Unfortunately, doesn't work for me either using FF 3.5 and Apache 2.2.3. I wish I knew what the problem is because the simplicity otherwise is tempting. One reason is that the file is stored in /var/tmp before it gets moved to ./files. But, I am afraid this is not all. Thanks a lot Flavio, this is indeed an very good pointer :-) Besides, I only now saw that Kirsle has come up with a new approach. This progress bar not working in chrome ans Safari...What to do??? The workaround is to have the form submit into a frame, like having an and then using . Thus the main page doesn't unload when the form is submitted (since it loads the form result in the frame instead), so ajax can run on the main page. 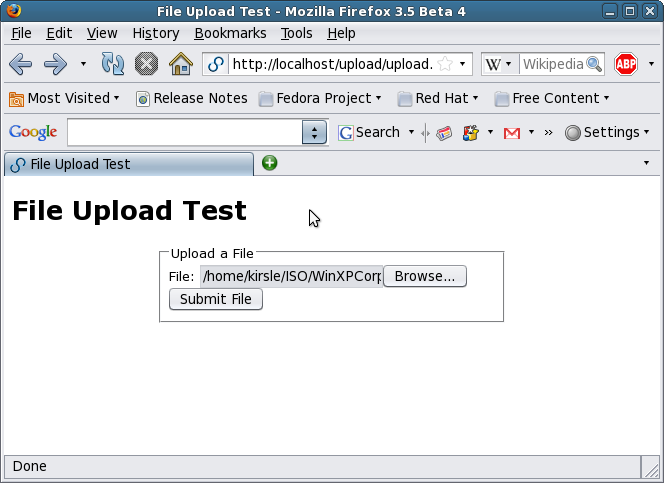 Finally I found file upload code written in Perl works fine. Thanks for your excellent work.